A. was a thirty-five year old executive who experienced anxiety when she drove her car and panicked when she had to ride escalators. There was no way for A. to avoid her driving anxiety or escalator phobia; A.’s job required her to drive to her company’s stores and ride escalators in shopping malls. During A.’s first visit, she described her driving anxiety as “hitting a brick wall.” A psychiatrist had prescribed A. anti-anxiety medication and sent her to a psychologist who specialized in treating post-traumatic stress disorder. A. said that after her visits to the psychologist, her automobile anxiety was greatly reduced. Unfortunately after A.’s visits to her psychologist, A. was behind the wheel when a drunk driver plowed his car into the back of hers. This accident rekindled A.’s fears of driving. 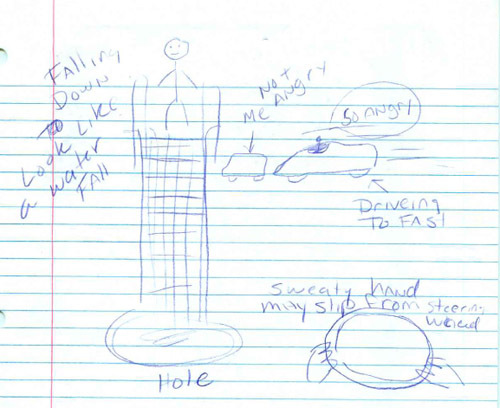 A. drew a picture of her car with the caption of “Me, NOT ANGRY.” Observe how the car behind A. was too close to her vehicle; the caption reads, “So ANGRY” and “DRIVING TO FAST.” Note A. wrote in all capital letters, which suggests she had highly charged emotions around driving. A. also drew a pair of hands on the steering wheel with a caption of “Sweaty hand may slip from steering wheel.” A.’s steering wheel caption suggested A. was afraid she was going to make a mistake driving and cause an accident. During regression, A. therapeutically relived the accident that occurred after her treatment with her psychologist. A. was driving with her mother as the only passenger in her vehicle when a drunk driver rear-ended A.’s car. The impact caused A.’s car to plow through a fence and hit a brick wall. The brick wall was the last and most dominant detail A. remembered about her accident. The car hitting her vehicle from behind explains why A. drew a picture of an automobile following too closely to her car. The brick wall as the last thing A. remembered explains why A. described her driving related anxiety as “hitting a brick wall.” Although A. used “hitting a brick wall” figuratively, A. had literally hit a brick wall. During her regression A. realized the accident wasn’t her fault, and that she was projecting or anticipating that the accident that had happened to her in the past was going to happen to her again. At her next visit, A. reported that she no longer had fear or anxiety while driving. For the escalator phobia A. drew a water fall with her standing at the top. 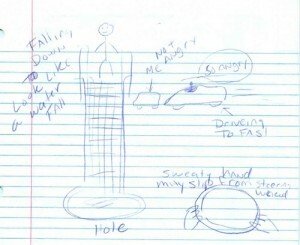 A.’s caption read, “Falling Down, Looks like a water fall.” At the very bottom of the drawing is the word, “Hole.” When A. told Dr. Stone her history, A. mentioned that while on vacation with her husband, she fell several feet through a hole that was created by a missing manhole cover. A.’s husband was able to lift her up through the hole and back on to the sidewalk. Fortunately for A. the only injury she suffered was a sprained ankle. Because A. fell through a hole with water, as A. and Dr. Stone looked at her drawing they speculated that A.’s escalator phobia may be related to her fall through a missing manhole cover. The belief was that when A. was near escalators she spontaneously regressed to the time when she fell through the open man hole. During her second appointment, A. reported little or no change with her escalator phobia. Dr. Stone regressed A. to an earlier age when A. witnessed a young child being stuck in an escalator. A. recalled seeing blood and paramedics treating the child. Previously A. said she had not witnessed any escalator accidents. For many years as a defense/coping mechanism, A. had blocked (repressed) the accident she witnessed until her appointment with Dr. Stone. While she recalled witnessing the escalator accident during her regression, A. said that there wasn’t much blood and the girl was OK. A. realized she overreacted and was again projecting or anticipating that the accident that happened in the past was going to happen again. Only this time A. had identified so strongly with the child who was stuck in the escalator that she thought the next time it was going to be her having an escalator accident. Having made the discovery of the source of her escalator phobia, A. was able to ride escalators without fear or anxiety. A. reported to Dr. Stone in follow-up phone calls that she was comfortable riding escalators. The insights I gained in my hypnosis about my anorexia, weight gain and the relationship with my mother and food were momentous, staggering, mind-boggling.